On December 14th, the Wolverines were 8-4. Just over a week later, they found out they were losing their star big man, Mitch McGary, for the season. It’s almost a guarantee, though, that John Beilein and his young team weren’t panicking. And that’s what seems to be the guiding principle of 2014 Michigan basketball. Cool, calm, steady, un-phased, and ready to execute. Despite their youth and lack of a true post presence, the Wolverines won ten games in a row before losing to Indiana on Sunday, and find themselves in the driver’s seat for the Big Ten title. Even though the Wolverines are starting three sophomores and one true freshman, Michigan seems experienced beyond their years, as the road wins and shocking upsets keep coming. Although on the surface, this calm, steady, veteran-looking basketball may surprise many after looking at the youth on the roster. The Wolverines have actually grown up beyond their years as a result of many valuable opportunities afforded to their young stars early in their careers. Glen Robinson III and Nik Stauskas started in the Final Four as freshmen. They experienced the pressure of being ranked #1, the embarrassment of seeing opposing fans storm the court after losses three times (at Penn State and at Wisconsin last year, at Iowa State this year). Robinson and Stauskas felt the pain of being on the floor when a Big Ten title slipped right through their fingertips last season. Taken together, these experiences sure make a trip to the Breslin Center for a regular season conference road game seem like nothing. The same can be said for sophomores Caris LeVert and Spike Albrecht. Both knocked two 3-pointers each in the Final Four matchup against Syracuse and Albrecht had his famous 17-point performance in the National Championship, knocking down four 3-pointers after taking over for Trey Burke once he got in foul trouble in the first half. Jordan Morgan and Jon Horford also bring a veteran presence to the team, as a result of more tangible metrics such as age and games played. Jordan Morgan won a Big Ten title in 2012 and he’s executing on the offensive end like he’s playing with Darius Morris, the point guard responsible for providing Morgan with a plethora of scoring opportunities as a freshman. Horford’s game has finally slowed down, as well. He now possesses a serviceable post game and a solid defensive presence in suitable matchups, a major asset off the bench. The freshmen have also displayed an impeccable learning curve as they improve their knowledge of Beilein’s offense each and every day. Derrick Walton, who struggled in road games at Iowa State and Duke to such an extent that Spike Albrecht played in crunch time, has notched critical late baskets on the road against Nebraska and Michigan State. His free throw shooting performance down the stretch of the Michigan State was cold-blooded. Likewise, Zak Irvin has morphed into a solid catch-and-shoot player, the perfect fit for Michigan’s offense, and he’s put together some incredible shooting performances against Minnesota, Stanford, and Iowa. The result of all these developments has been road dominance in Big Ten play. An 8-point deficit against Michigan State in the second half? No big deal. A ferocious end-of-game rally against the Badgers that elicited memories of previous heartbreaking losses in Madison? Didn’t happen this time. Last second paint defense against Nebraska? Michigan emerged victorious. This team finds ways to win games but in a different way than last year. 2014 Michigan doesn’t have a Trey Burke who can win games on his own for them. This team relies on team-basketball principles such as execution, ball movement, screens, cutting, timely defense and cold-blooded shooting. While Nik Stauskas has emerged as the alpha dog and certainly had his moments of clutch play, he doesn’t dominate the basketball at the end of games and it seems as if all members of the Wolverines must contribute their part in order to emerge victorious on any given day. This whole process has all come together because this team has learned how to win together. Without road games in tough environments like Cameron Indoor and Hilton Coliseum, the Wolverines are unprepared to go into Wisconsin and win for the first time in 11 years. Without a test against the #1 team in America, the Arizona Wildcats, where shoddy execution let the Wildcats steal away a victory, the Wolverines aren’t prepared to defeat three top-ten in the span of one week. It sure does help that Michigan has a really good offense. The Wolverines shoot 49% from the field, 74.9% from the line, and 39.5% from three-point territory. Jordan Morgan is shooting a whopping 69.8% from the field while Stauskas and Robinson are both dead even at 50%. 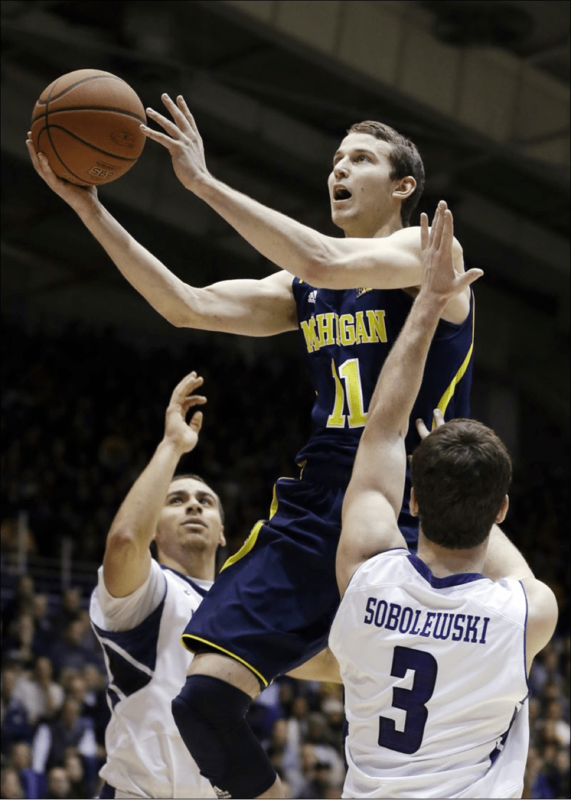 Stauskas leads the team with 50 three-pointers, 116 free throw attempts and 72 assists on the season. Many have come to question whether last year was a one-hit wonder, especially with the loss of Michigan’s top two scorers. It was easy to do so when, at 8-4, Michigan’s hopes of making the NCAA Tournament were beginning to come into question. This recent stretch of play should easily quiet these concerns. John Beilein has, year-in and year-out, proven he knows how to win, no matter how much his teams have to grind, claw, and three-point shoot their way to victory. With another team dreaming of a deep postseason run and going toe-to-toe with the Big Ten’s best, one thing is for sure; Michigan’s basketball program is in the right place, with strong leadership at the top, and players buying in. In Beilein We Trust.